'Legenderry: Green Hornet' has been a fun and wild ride. Things are only getting more tense and exciting in the penultimate issue four. 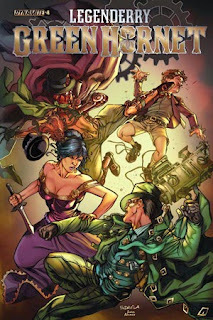 Green Hornet and Kato join forces with the Brass Hornet to take down Lidia Valcallan. They just have to survive the night running a gauntlet of gangs to get to her. Daryl Gregory may be having the most fun writing a comic right now as he describes Little Lord Homicide as having "mommy issues." This alternative steampunk universe of Green Hornet doesn't take itself too seriously which leads to a lot of clever humorous moments, but there's still an edge there. It's an action-packed issue that pays a nice homage to the classic cult film, 'The Warriors,' where in the film one gang has to fight their way through several gang territories. Brent Peeples' fantastic character designs add some personality behind the mostly stoic masks. The action is cinematic and larger than life with big explosions and crashes that are over-the-top. 'Legenderry: Green Hornet' #4 is a complete joy to experience. GH and Kato are men of action in the middle of an old-fashioned adventure tale against dastardly baddies. It will all lead to a showdown with the Veiled Lady.